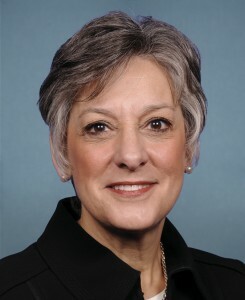 U.S. Rep. Allyson Schwartz, Democratic candidate for Governor, is already picking up endorsements ahead of next year’s campaign. She has been endorsed by the EMILY’s List PAC, which supports pro-choice Democratic female candidates, as well as the United Steelworkers Local 10-1. The EMILY’s List endorsement isn’t an unexpected move given Schwartz’s connections with the organization. They were part of the crowd seeking to recruit her to the race, including commissioning a poll in March that showed the five-term Congresswoman leading the Democratic primary race. The PAC offers institution support – namely fundraising – to candidates. But Schwartz isn’t the only woman seeking to challenge Gov. Tom Corbett. Kathleen McGinty, former Pa. Secretary of Environmental Protection, is also running. Among the three other declared candidates, all men, are McGinty’s DEP successor John Hanger, former Revenue Secretary Tom Wolf, and minister Max Myers. According to a press release, Schwartz also picked up the endorsement of the United Steelworkers Local 10-1, making it the first labor union to choose a candidate in the race. A poll conducted last month by Quinnipiac showed Schwartz tied with Joe Sestak in the race. Sestak has since announced he will instead challenge U.S. Senator Pat Toomey in 2016. Wow, please take a few seconds to get your facts right BEFORE publishing the story. Tom Knox, a retired businessman from Philadelphia and 2007 candidate for Mayor of Philadelphia, is NOT a candidate for Governor of Pennsylvania (he has disclaimed interest in the 2014 gubernatorial race), and he briefly flirted with running for governor in 2010 (he never filed any papers). Tom Wolf, a former Pennsylvania Secretary of Revenue and businessman from York, IS a candidate for Governor of Pennsylvania. Tom Wolf and Tom Knox are two very different people. You are reporting news, and even CNN would have had it right.